The first SEA-GIC held in 2015 brought together undergraduates from several ASEAN universities. 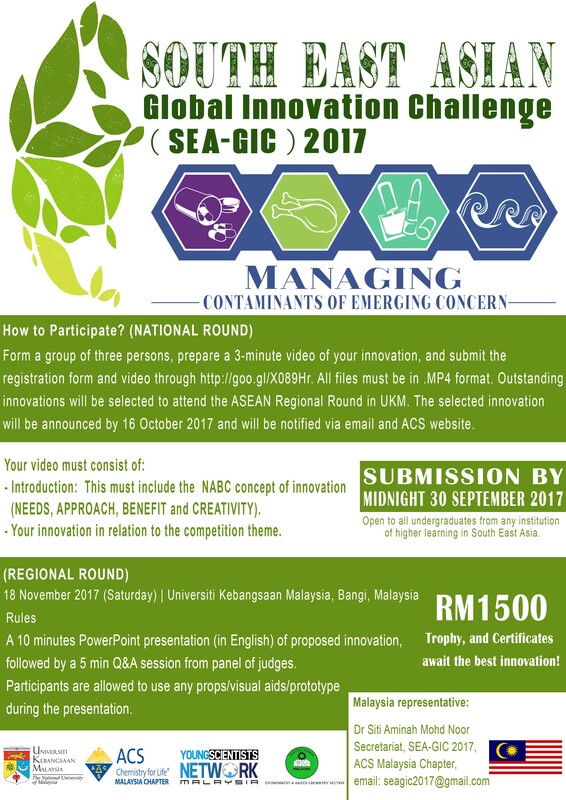 The challenge returns this year in Universiti Kebangsaan Malaysia with a new theme which allows participants to showcase their innovation in managing contaminant of emerging concerns. The finalists for the ASEAN Regional Round will be selected from submissions at the National Round through rigorous selection by the National Round Committee in their respective countries. The finalist from universities in ASEAN countries will convene in Malaysia to pitch their innovations to our distinguished judges. Emerging contaminants can be broadly defined as any synthetic or naturally occurring chemical or any microorganism that is not commonly monitored in the environment but has the potential to enter the environment and cause known or suspected adverse ecological and(or) human health effects. In some cases, release of emerging chemical or microbial contaminants to the environment has likely occurred for a long time, but may not have Household products related to emerging contaminants been recognized until new detection methods were developed. In other cases, synthesis of new chemicals or changes in use and disposal of existing chemicals can create new sources of emerging contaminants.